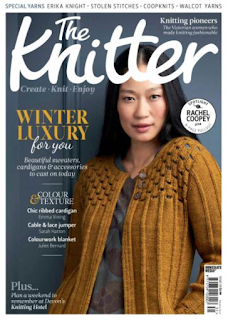 Emma Vining Hand Knitting: Cover Design for The Knitter Magazine! 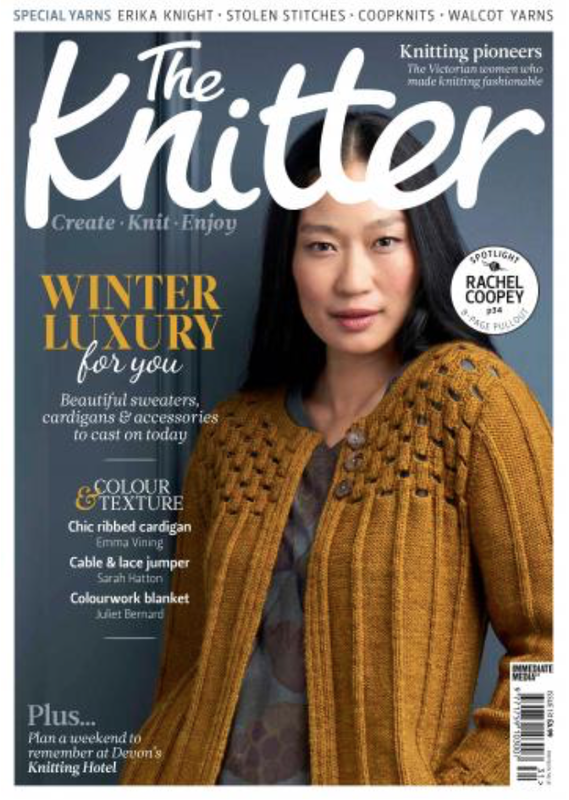 Cover Design for The Knitter Magazine! 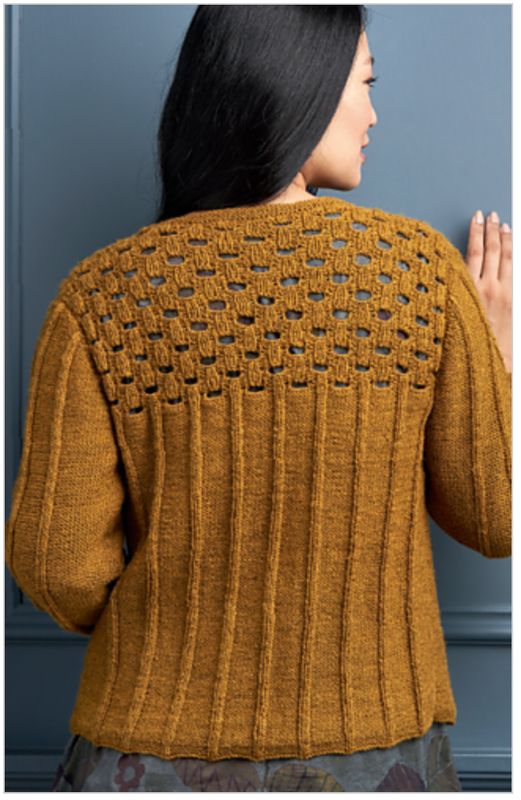 When Issue 131 of the Knitter Magazine arrived in the post, I was really excited to find my Shaftesbury cardigan design was featured on the cover! Knitted in Walcot Yarns gorgeous Opus yarn, Shaftesbury is an elegant ribbed cardigan with openwork details on the upper body. The stunning shade is called Goldenrod. The openwork pattern is knitted using the one row buttonhole technique. As well as being my preferred way of making buttonholes, I really like using this method to make slots in knit designs. In Shaftesbury, the slots are linked by a rib pattern and placed to form a larger lattice. I love the way a little glimpse of whatever you wear underneath will show through the slots. 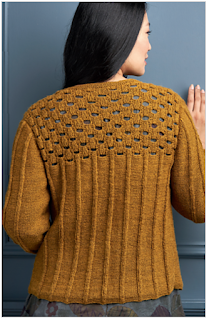 In the shoot for the Knitter Magazine, my cardigan has been paired with beautiful Gudrun Sjoden garments. 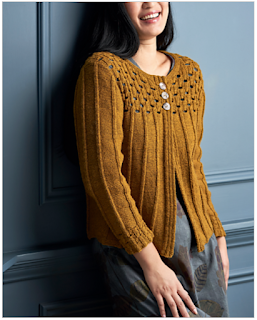 As well as more images of Shaftesbury, you can see several of the other beautiful designs from issue 131 on Ravelry. Hello and thank you for reading my knitting blog! I am an enthusiastic and creative knitter with a strong interest in the design and technical aspects of knitting. I am the author of "A Knitter's Sketchbook", published in January 2019. My original hand knitting patterns can be found in publications such as The Knitter Magazine and I am a designer for Yarn Stories. As an active member of the Knitting & Crochet Guild, I regularly contribute articles to the Guild publication, Slipknot. You can always find me on the Guild Stand at events like the Knitting and Stitching Show, so please come along and say hello! As well as being an experienced knitter, I am City and Guilds qualified, having completed the Level Three Certificate and Diploma in Hand Knit Textiles. Research for my designs involves attending knitting events such as the Knitting and Stitching Show, The Knitting History Forum and the ‘In the Loop’ Conferences. I m constantly inspired by the wonderful Victoria and Albert Museum in London where I am proud to be a volunteer. I love working on projects which combine multiple knitting techniques with inspiration from everywhere I go! Emma's Favourite Places to Read, Learn and Enjoy! Picture Window theme. Theme images by MichaelDeLeon. Powered by Blogger.